The objective of the Southington Girls Softball League shall be to implant firmly in the children of the community, the ideals of good sportsmanship, honesty, loyalty, courage and respect so that they may be well adjusted, stronger, and happier children and will grow to be good, decent, healthy and trustworthy citizens. The operation of SGSL is comprised of many activities that take place that most very seldom see and may not be aware of. These include but but are in no way limited to: Field Maintenance Committee to keep our 10 playing fields in a good and safe condition; Various pre-season Organization Committees; Concession Stand Committee to help in the operation of our main source of income; Raffle Committee, Banquet Committee. All of this activity is done for the benefit of your daughters by volunteers. 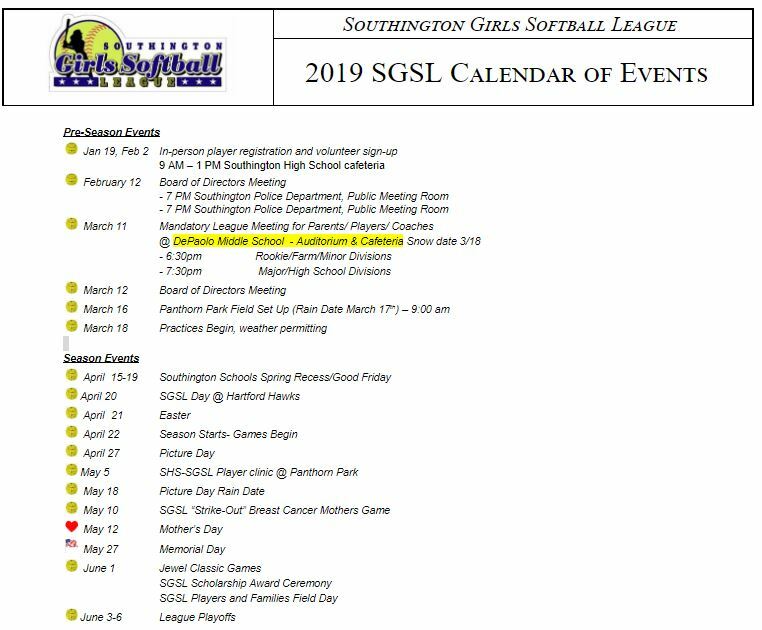 SGSL is one of the finest, if not the finest, facility within the state of Connecticut, that is dedicated to girls' softball. Comments validating this have been made year after year by coaches and officials both within and outside of the Town of Southington. However, none of this happens without your help. So please, ask any of our Executive Board members how you can get involved. Everyone has a very busy schedule but just a few hours of help is invaluable to both the league and your daughters.